"As you seek spiritual knowledge, search for principles," counsels Elder Richard G. Scott. "Principles are concentrated truth, packaged for application to a wide variety of circumstances." In this exciting book, Elder Scott offers 21 principles distilled from his life experiences. These "concentrated truths" will help you understand more fully how to be guided by the Spirit. Elder Scott's brief explanations open the way for your own discovery and exploration. "I bear witness that Jesus Christ knows you personally," Elder Scott writes. "He will provide answers to every difficult problem in your life as you trust Him and do all you can to understand and apply His doctrine and strive to live by the Spirit." 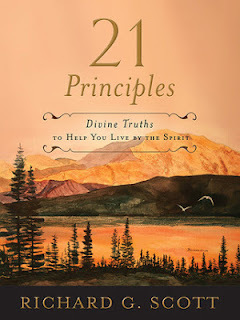 21 Principles will be a valuable tool in that quest. I knew I would love this book because I love each one of Elder Scott's talks. The book is so wonderful because it walks you through how to truly have divine inspiration in your life, which I feel is the key to making it through this life with joy and peace. I would highly recommend this book to everyone who is searching for truth and light. Haven't heard of Richard Scott before. Will check out his book. Thanks, Vicki! He is an amazing man, an apostle in the LDS Church. One of the chapters in his book is dedicated to his respect and admiration for women and he shares some of the tender experiences he had with his wife. Such a loving, kind man.